A U-Cup is a type of seal that is formed into a u-shaped channel that is utilized in pressure applications where an O-Ring is not desirable. Liquid or air pressure "inflates" the U-Cup and creates a seal. U-Cups are utilized in numerous applications, commonly found on cylinders or counter balances and as either rod or piston seals. U-Cups come in a wide array of sizes depending on the application. Generally the larger the application shaft size and greater the pressure, the more desirable it becomes for an application to utilize a U-Cup over an O-Ring. Standard U-Cups are made out of fabric and rubber; however they can be made out of other materials such as leather or urethane. Leather U-Cups are still available however their use has decreased over time as there are more effective sealing options. 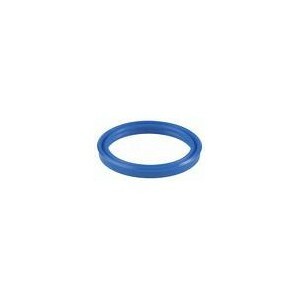 Urethane has become an increasingly popular U-Cup material as it is more chemical and wear resistant. Bearing Service partners with a local company to be able to manufacture U-Cups up to 24” same day out of urethane, with larger sizes available by the next business day. Please contact a Bearing Service representative to discuss your application.